Entries from Digital Intelligence tagged with "zenithoptimedia"
With assistants like Siri, Cortana, Google Now and Facebook M set to become major interfaces, what are the key trends around voice controls? New data looks at the users and motivations behind this growing technology that could change the face marketing as we know it. The amount spend on internet ads worldwide is catching TV at a rate of growth that could see it become the dominant medium by 2018, according to a new report. In 2013, the internet passed newspapers to become the world's second-largest ad medium, behind TV, according to this chart from ZenithOptimedia. This chart shows the forecast for the top 10 ad markets in 2015. The US is still number one on the list increasing its spend by over $20m. 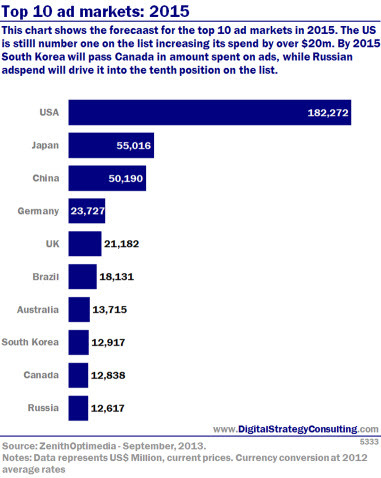 By 2015, South Korea will pass Canada in amount spent on ads, While Russian adspend will drive it to tenth position on the list. This chart show the top 10 ad markets in 2012. The US leads the top ten by a large margin, spending almost $110m more than Japan (the second highest spending country in the top 10). 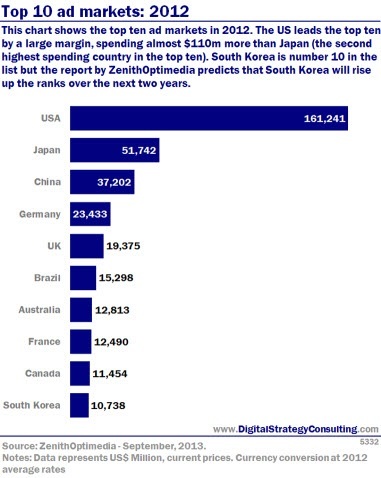 South Korea in number 10 in the list but the report by ZenithOptimedia predicts that South Korea will rise up the ranks over the next two years. Global advertising expenditure is forecast to grow 3.95% during 2013, and is set to overtake print ad spend by 2015, according to a new report. UK internet advertising spend is forecast to grow 10.3% this year, accounting for more than a third of all UK ad spend, according to a new report. Media buying network ZenithOptimedia raised its full-year forecast for internet growth from 9.3% to 10.3%, marking a rise of £200m. UK internet advertising spend reached £4.78bn in 2011 to account for 28% of total advertising spend in the UK, according to figures compiled by the Internet Advertising Bureau. Just five companies (Google, Yahoo, Microsoft, Facebook and AOL) control 64% of all online advertising spending, according to a new study. The data was calculated by entrepreneur Darren Hermen, using figures from ZenithOptimedia on October 3, 2011, which stated that worldwide digital advertising accounted for about $64.03bn. The latest global adspend forecast from ZenithOptimedia has revised the firm's 2009 prediction from -6.9% to -8.5%. The firm's downgraded figures follow lower than expected results for Q1. Not all markets are in decline, with 25 of the 79 analysed still showing growth. Overall ZenithOptimedia expects mild recovery in 2010, though neither North America nor Western Europe are expected to return to growth until 2011. Online advertising remains the only sector expected to grow in 2009. The firm anticipates online advertising will increase 10.1% during 2009 (to $56,797m or £34,443m) reaching 15.1% of global adspend by 2011 (from 10.5% in 2008). Newspapers however will continue to decline, falling to 22.7% below their 2007 peak, by 2011. ZenithOptimedia also expects 2009 to be the year China overtakes the UK as the world's fourth largest ad market, on the back of 5.4% growth. In contrast the firm estimates total advertising spend in the UK will drop by 10.5% during 2009, with a further fall of 1.4% in 2010 before the market recovers in 2011. The latest forecast from ZenithOptimedia predicts that global media spend will decrease by 6.9% during 2009, writes Brand Republic. In particular the firm expects drops of 8.7% in the UK, 8.3% in the US, 5.5% in Germany and 5% in Japan. All forms of media will see cuts except for online which is predicted to grow 8.6% worldwide this year to $54bn (overtaking magazines for the first time). Online's share of global adspend will also grow, from 10.4% in 2008 to 12.1% in 2009, Only television will also increase its share (from 38.1% to 38.6%) though actual spend will fall 5.5% to $173bn. The firm now expects positive growth to return in 2010, with the global spend forecast to rise 1.5%. While marketing budgets across the board are feeling the pinch the IPA's latest data shows that online remains the only sector experiencing positive growth. In addition, revised forecasts from ZenithOptimedia now expect online to take 10% of this year's global advertising spend. This month has also seen further evolutions in digital convergence - a trend we have been tracking in Digital Intelligence from the very beginning. Soon both Sony and Microsoft will have video-on-demand services for their various multi-function gaming devices, and both firms are now bringing in content partners to widen their offerings. As consumers we're now used to the idea of things being connected and able to fulfil many roles - so it was no surprise this month to see that Facebook now takes over 45% of the UK's social networking traffic. Perfect timing then for us to tell you about a little Facebook app we've built to send you our latest news and headlines. A new forecast from ZenithOptimedia predicts that online advertising is on course to take 10% of all global adspend during 2008, writes ClickZ. The firm has revised its last forecast from March to take into account the current economic problems. ZenithOptimedia now expect online adspend to reach $52.2bn (10%) in 2008, rising to $78.2bn (13.6%) in 2010. Their previous forecast put online at 9.7% ($47.5bn) for 2008, rising to 12.3% (66.9bn) in 2010. ZenithOptimedia has upgraded its predictions for online adspend's share of the total global ad market for 2008 from 9.4% (from its December forecast) to 9.7%, writes Netimperative. Online is expected to show strong growth despite a slowdown in US and Western European total adspend. For 2009 the firm is expecting online to take an 11.1% share of global adspend - up from its previous forecast of 10.4%. Online adspend is already topping 10% of the media channel mix in several countries, and ZenithOptimedia are predicting that worldwide it's now on course to top radio by next year. In the UK our own analysis now puts online above direct mail, and we remain confident in our 2005 prediction that online would overtake TV adspend in the UK by the end of the decade. Although online can build brands as powerfully as it can generate direct sales, the success of search engine advertising continues to be a key driver in the refocusing of marketing towards the web across Europe. That's why this month our Company Focus looks at Google, with a round up of the top ten news stories from the search giant. A new study from ZenithOptimedia predicts that global online adspend will grow six times faster than traditional media spend between 2006 and 2009, with its share of the market growing from 5.8% to 8.7% during the same period (with revenues rising from $23.4bn to $42.9bn (£11.83bn to £21.68bn)), writes ClickZ. The company now expects global online advertising to overtake radio by 2008 - a year earlier than they predicted in December. This will put online in fourth place behind television, newspapers and magazines. ZenithOptimedia predicts that online spending will grow 28.2% during 2007 (against total market growth of 3.7%). By 2009, online adspend will account for nearly 9% of all advertising expenditure. Online adspend already accounts for more than 10% of total marketing spend in the UK, Norway and Sweden.